A land of remarkable diversity – from ancient traditions and artistic heritage to magnificent landscapes and culinary creations – India will ignite your curiosity, shake your senses and warm your soul. From the towering icy peaks of the northern mountains to the sun-washed beaches of the southern coast, India’s dramatic terrain is breathtaking. India has always amazed tourists from the Netherlands making it a highly sought tourist destination. Realizing this high global demand and the potential of the tourism industry in India the government of India liberalized the visa application process by introducing E-Visas. Now it is easy to avail Indian E-Tourist visa for Netherlands citizens. As per the statistics published by the bureau of immigration of the Indian government, around 19,000 tourists from the Netherlands visited India in 2016. We did around 17,000 hassle free visa service in 2017. Is it possible to avail an Indian tourist visa on arrival for citizens of Netherlands? No, it is not possible to apply for an Indian visa on arrival at Indian airports as ETVs (Electronic Travel Visas) were introduced to replace the existing visa on arrival system. Effective November 2015, it has been made mandatory for foreign nationals who visit India to have a valid visa while they arrive at India. People who arrive at India without a valid travel document will be sent back to their country of origin. In fact, you will have to show a valid visa before you can board a fight to India. How long will it take to get my E-Visa as a citizen of the Netherlands? Once you submit your completed application, officers from the Indian government will scrutinize your application to check for any discrepancies. If at all they find any doubtful points you will be asked to present additional documents as per the need. Only after a thorough check of your application, visas will be issued to you. It normally takes around two to four days to get your visa approved. We suggest you apply for your E-Visa 10 days prior to your journey to avoid the last minute confusions. How many times can I enter India with a single Indian E-Tourist visa? E-Tourist visas hold double entry benefits. The visa is non-extendable and non-convertible. How long is the Indian E-Tourist visa valid for? The Indian E-Tourist visa is valid for 60 days from the day of arrival in India. Once you arrive in India you need to submit a printed copy of your travel document (E-Visa) and passport for verification at the immigration desk. Once the verification is complete your visa will be stamped by the immigration officer and the validity of your visa will be written on your passport. If you are in need of a visa with longer validity and with multiple entry benefits you should apply for a sticker visa. Unlike E-Visas, sticker visas cannot be applied online. The application for which has to b made at the concerned Indian embassy. How much does it cost for India E-Tourist visa for citizens of Netherlands? The visa fee for citizens of Netherlands is €41. Credit card companies normally charge 2.5% on this amount as their commission. If you want us to handle your visa application process, we charge $25 as our service charge. You need to take a print out of the document (E-Visa) because you need to show it to the immigration officer while you go through immigration clearance. It is imperative that you have a hard copy of your visa at all times when you are in India. After verification of your Visa and passport, you have to give your biometric information. Then an immigration officer will place a visa sticker in your passport. 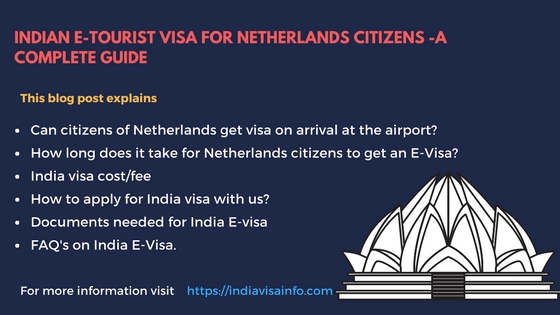 What are the requirements to apply for India E-Tourist visa for Netherlands passport holders? Make sure that your passport has a minimum of 6 months validity and at least 2 blank pages left for stamps. Your sole objective of visiting India must be for recreation (sightseeing or tours) or casual visit to see friends or relatives. (Remember that this E-Tourist Visa is NOT valid for employment purposes and NGO/volunteer activities. If you’re a journalist or if you’re visiting India for a conference, there is a separate visa for that which you can apply directly for at an Indian Embassy). Is it easy for citizens of Netherlands to apply for India E-Visa? Though the Indian government has liberalized their visa policies to make the visa process easier, the application process still remains as a hideous task. The online portal where one needs to apply for India E-Visa is one of the dreadful portal one can find on the web. The website is unreliable because the servers are not maintained properly. One can expect the website to become unresponsive anytime while filling in the application form. You need a lot of patience to finish the part one application and generate an application ID. The second step in the application process is remitting the fee against your application ID. Before you proceed further, we would request you to go through the commonly faced issues with the payment portal. The banks are not adequately equipped to accept online payments. You get only 3 attempts to make the payment successful. So If you fail to make a payment the third time your application ID will be blocked. You will have to generate a new application ID by filling in the application form from scratch again. We offer the best in the industry visa service. The dedicated and expert visa agents working with us will make sure that you will get your E-Visa with minimum hassle to you. You only have to fill in the below-given application form and sit back and relax while our agents handle everything. Do I get a discount if I only want your assistance in making the payment against my visa application? For customers who only want our assistance in making the payment we charge only $25 as our service fee. Foreign nationals can apply for a maximum of two times in a calendar year (from 1 January to 31 December). Therefore, those who are in need of a visa with longer validity and multiple entry benefits they can apply for a sticker visa at the concerned Indian embassy. You can exit through any of these airports/seaports. How long will it take to get my E-Visa if I avail your service? Within 12 hours of placing an order, our agents will contact you and collect all the needed information from you. Once we have all the details and documents we need, we will apply for your E-Visa. We will need a minimum of 2 working days to procure your E-Visa. Whom do I contact for help with my visa application? You can either E-mail us to care@indiavisainfo.com or call us at +919632751222 for any help with your visa application.